For the unfamiliar, a tariff is simply a tax imposed by a country on goods imported from abroad. It is not at all an uncommon feature of international trade and there are thousands of active tariffs between countries for everything from live animals, to lumber, to industrial metals. According to the international trade commission’s harmonized tariff schedule, 5,300 items are eligible for tariffs. In the U.S., typically they are imposed after an industry group brings evidence of unfair trade practices to the attention of Congress. Often, these unfair practices are called ‘dumping’, in that state-subsidized products are dumped on another country at such low prices that domestic industry cannot compete. Tariffs on that product may be imposed to protect the domestic companies from the below-market priced product and save those companies and jobs that produce it. These types of actions are usually targeted against specific countries and products. It was both the seeming impulsiveness and the broad-based nature of the announcement last week that caught many observers off-guard. Since then, the administration has both offered exemptions for Canada and Mexico and left the door open for other allies to make their case to be excluded as well, a significant softening of the original proposal. It is also likely that the proposal will undergo further changes, despite the White House indicating their stance is firm. Figure 1: “…trade wars are good, and easy to win…” said President Trump in a recent tweet. Most economists would disagree with that statement. Studies of past U.S. protectionist actions conclude that the most likely outcomes are a temporary boon to the target industry, and offsetting detriments to consumers and industries elsewhere. Predictably, the domestic steel industry applauded the announcement as it has been in decline for decades. However, the data shows that the decline in our domestic steel industry from the 1970s and 1980s to today is primarily a result of massive productivity gains and a halving of domestic steel demand. According to steel.org, the labor required to finish one ton of steel went from an average of 10.1 man-hours per finished ton in 1980 to an average of 1.9 man-hours per ton in 2015, with many plants now operating at under 1 man-hour per ton, more than a 500% increase in efficiency. Over that same period, according to the World Steel Institute, annual per capita consumption of steel in the U.S. has fallen from 637 kilograms in the mid-1970s to 336 kilograms in 2015. 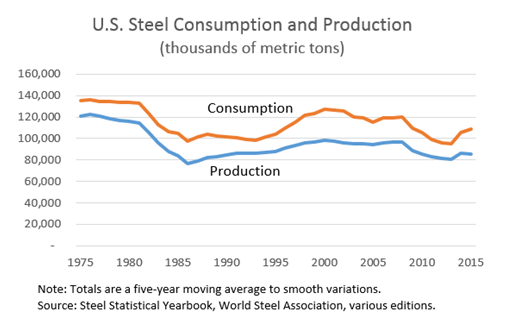 Domestic steel consumption has clearly fallen from the 1970s and 1980s, but the takeaway from this graph is the space between production and consumption. Our domestic steel industry currently accounts for about 80% of consumption, almost the same as it did in the previous decades. This refutes the idea that imports have undercut our production capacity. While the political motivations for the move are apparent, it is difficult to find the economic value in artificially expanding our less efficient steel and aluminum production industry, which employs about 150,000 people, when steel and aluminum using industries employ more than 5M people. On one premise, it is true that the United States is one of the freest trade countries in the world, and other countries do in fact explicitly tax goods imported from the U.S. or subsidize their own industries to make their products cheaper on the global market. But many economists would argue that cheaper goods are a net positive for the U.S. consumer, and consequently a net positive for our economy. The U.S. economic engine is driven primarily by consumer spending, making up about 70 percent of our GDP. Cheaper goods from abroad leave our consumers more money to spend domestically. We are simply not an export driven economy. 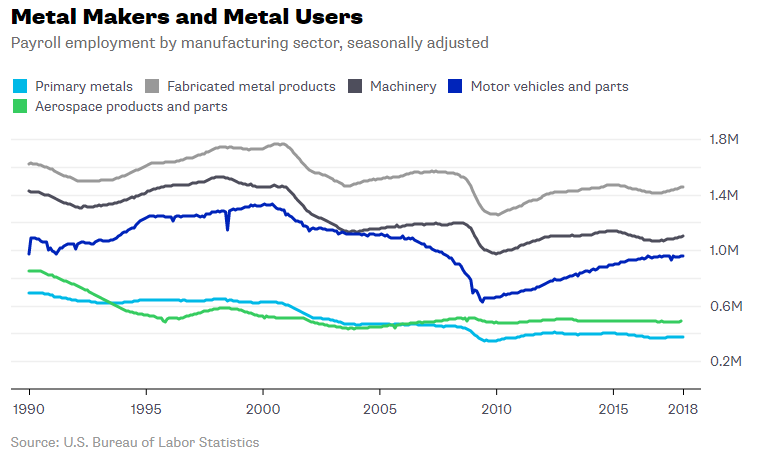 Millions work in ‘metal using’ industries, sectors where the employment levels have held up much better than the ‘metal making’ industries; a contributing factor of which has been cheaper input prices. 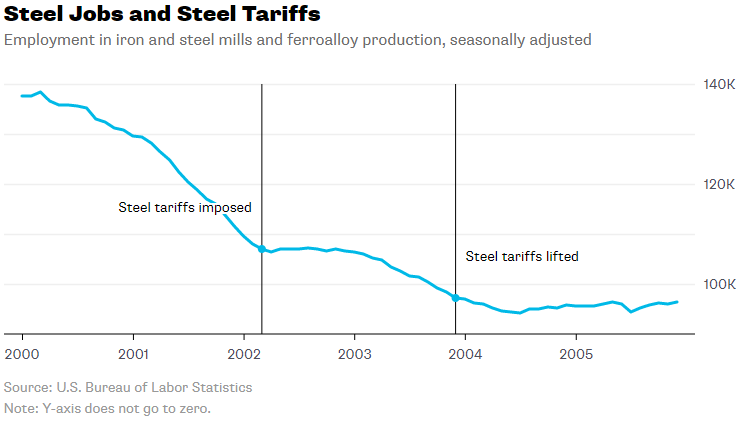 When President Bush imposed 30% tariffs on steel in 2002, it did arrest the decline of steel manufacturing jobs, but only for about a year. But according to an analysis by Trade Partnership Worldwide, an estimated 200k people lost their jobs in downstream industries by the following year, more workers than the entire steel industry employed at the time. 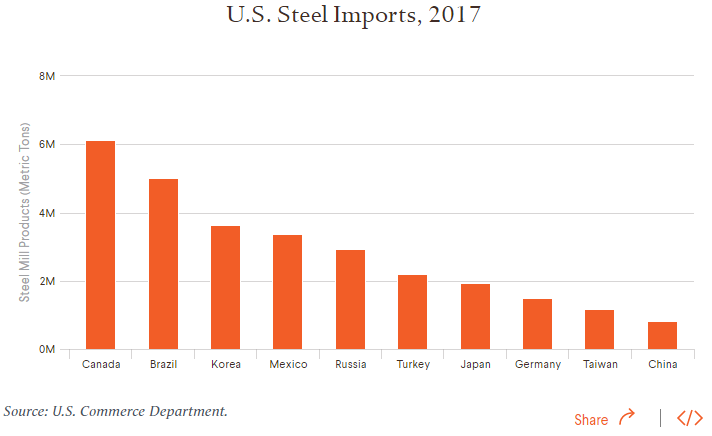 Citing ‘national security’ concerns as a reason for the tariffs has been considered invalid by many observers, since most of our steel comes from allies in Canada, Korea, Mexico, Japan, and Germany. Ultimately, tariffs are taxes. At this point we do not believe these new ‘tax hikes’ are anywhere near enough to offset the gains from the broader tax cuts recently passed, but they will raise the price of goods throughout the economy, could spark retaliation from trading partners and do nothing to promote economic growth or create jobs from a net perspective. We should let history be our guide on this one.